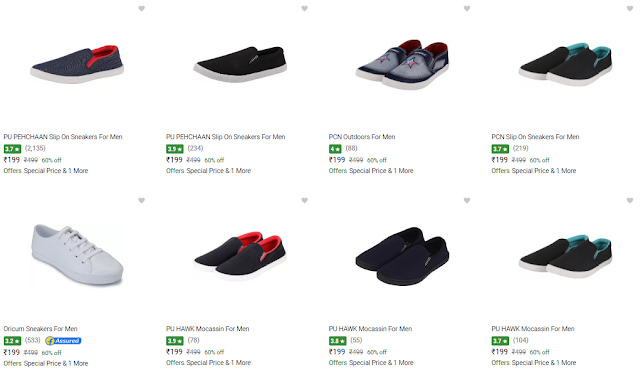 Buy any casual shoes only at Rs 199 with Flipkart Plus Membership. This are made from quality material. So, You don't need to be worried about its durability. Remember, This sale can be end in near time. So, hurry....! There's Bank Offer, which gives 10% Instant Discount on Mastercard for First Online Payment. This Offer is applicable only for new user. Another offer for Axis Bank Account Holders, Get 5% Discount from Axis Bank Buzz Credit Card. This casual shoes are produced from superior quality raw material and latest technology to ensure superior quality products. This products are environmentally responsible and are made from recycled materials from regenerate forest sources in compliance with applicable environmental standards.